Urgent need for money to cover legal fees for Tyendinaga Warriors. 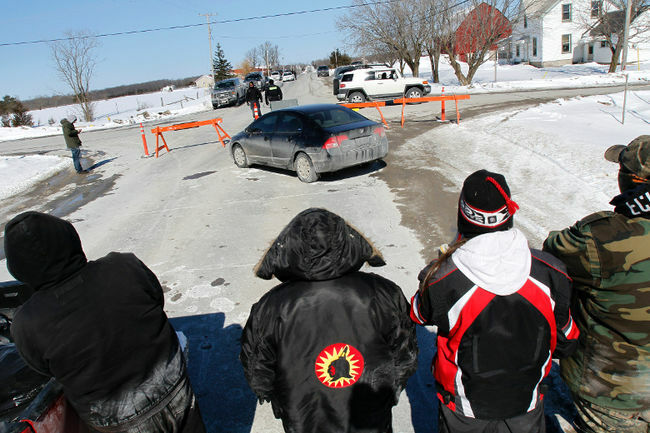 During the rail blockade, Shawn Brant, Matt Doreen, and Marc Baille were arrested and are facing charges ranging from mischief for blocking the tracks and blocking a road to assault police, and possession of weapons. Steve Chartrand was arrested on the Thursday following the blockade on charges of mischief. Other charges have been announced in court, but have yet to be formally laid. Marc Baille remains in custody, after refusing to sign restrictive bail conditions that he deemed to be unreasonable and unlivable. These court-ordered conditions would effectively ban him from the Tyendinaga community and prevent him from associating with members of his family, and further keep him from working at the motorcycle shop where he has worked for four years, causing a significant financial strain on his family and on the motorcycle shop. The two others arrested on Saturday were released on bail Sunday morning. Shawn Brant reported becoming violently ill after a meal provided to him while in detention in the OPP detachment at Napanee, where he received no medical assistance despite alerting an officer to his condition. For more information, click here. Currently, there is an urgent need to raise money in order to retain lawyers, to run bail reviews and superior court appeals on the non-association conditions, to order court transcripts, to cover transportation costs to and from court and jail, and to cover canteen fees and collect calls for those in detention, and to support families as necessary.. Meanwhile, the Canadian government remains complicit in the murder and disappearances of hundreds of indigenous women. Actions to demand justice for these women, their families, and their communities are as important now as ever! This entry was posted in Local Prisoners, Quinte Detention Centre, Repression. Bookmark the permalink.